Taxis that hover over water could be the future of transport in congested cities with waterways such as London. French pioneer Alain Thebault and his Swedish business partner, Anders Bringdal, have asked the mayor of London for permission to test the pod-shaped river taxis on the Thames later this year. Thebault, a yachtsman and inventor, designed the SeaBubble to skirt above the water noiselessly and with zero impact on the environment. Paris mayor Anne Hidalgo has already backed a trial of five SeaBubble taxis on the Seine this summer, in what some predict could herald in a new era for urban transport. Hidalgo, a supporter of the eco-friendly alternative to taxis, said the test-period represented a big step forward. 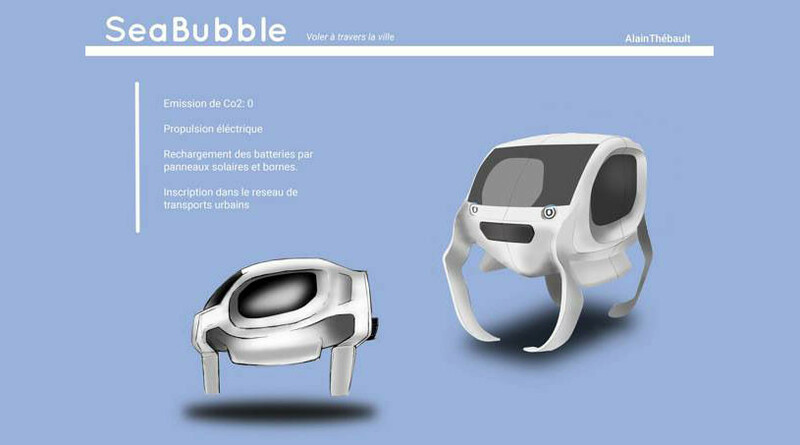 “SeaBubble is going to be the future taxi service on the Seine,” she added. The designers hope the battery powered, bubble-shaped pods will one day become fully autonomous. At the moment, French law requires ships operating on the Seine to have a captain. The futuristic ‘flying’ taxis are designed to hover 2 feet (60cm) above the water, which reduces the amount of drag by up to 40 percent compared to normal boats and enables the pod to reach speeds of 18 mph (30 km/h). SeaBubbles are based on an experimental sailing vessel, also designed by Thebault, called the Hydroptere, which uses air to generate lift. Because the pods generate no waves, they are able to operate in no-wake zones. Journeys are expected to cost less than £10 ($10) and each taxi has a range of 50 to 60 miles (80 – 100 km). He added that officials in London had been in touch about hosting tests of the new technology. Speaking to French news website The Local, Thebault said: “The idea actually came from my daughters after I sailed from LA to Hawaii recently. “They told me to invent a zero-emission cab because they were sick of seeing the pollution in Paris, London, and in the US.